January 29, 2016 – Today’s history author, Richard Rhodes, has edited or authored several history books including The Making of the Atomic Bomb, winner of a Pulitzer Prize in non-fiction. 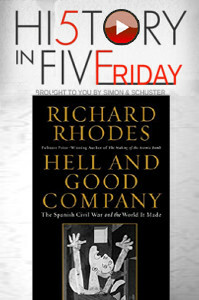 His most recent book is Hell and Good Company: The Spanish Civil War and the World it Made . The fighting took place from 1936 to 1939, and so is often lost in the catastrophe of World War Two. But the Spanish Civil War featured many of the same players, and some names from literature that may surprise you. In many ways, Spain’s fighting set the stage for the carnage that was to engulf the world in flames.